If you are experiencing an issue that causes your Apple iPad Air to freeze, you can do a ‘soft reset’. 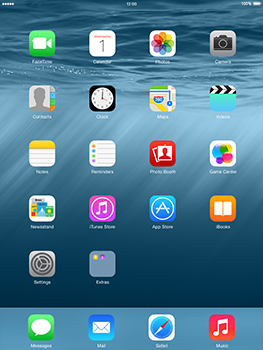 Doing a soft reset will not delete any personal data, files or apps on your Apple iPad Air. To reboot the Apple iPad Air, press and hold the power button on top and the home key until the screen turns off. The Apple iPad Air will automatically reboot. The Apple iPad Air has been rebooted. To completely restore the original settings and clear all data from your Apple iPad Air, you can do a ‘factory reset’. If a reset does not resolve your issue, you can also check for software updates for your Apple iPad Air.